▷ Best Purple Highlights 2019 ¡Photo ideas & step by step! The truth is that when hear the words purple highlights most of the us don’t get really excited about the theme, they are believed to be found in mermaids, fairies and all of those fantasy creatures that we can find in fairy tales. But would you believe me if I told you that you can have those hair colors that are known to be in those stories and that these purple highlights could look perfect on you? Many people do not believe that this could be the right color to have a makeover but, in fact, purple has just a wide variety of shades that at least one of them has to favor your skin tone! Now, come on girls, we have to realize that blonde is not the only color that we can turn to when we want a change of look, here I am to uncover some myths about the way purple highlights look on us. There are so many options and variety that you can choose to check all the things on your list for the perfect hair that all you have to do is think outside of the box and ask your stylist for what would look good on you and remember they are the experts but you will always have the last word on what ends up going on your hair, so take the risk maybe you will end up with a look that couldn’t even dream about. Plus, fantasy colors are in right now! Just take a look around you while you are outside at the mall or in the park and you will spot maybe a few or a lot of people that have these fantasy colors. Brown hair is usually seen as a boring and safe option just for the simple fact that is common, and although it’s a great hair color all by itself with all its under tones and natural highlights below the direct sun light, applying purple highlights to it will let you dress it up and make it your own. Don’t pay attention to what other people say, take your actions and show them that brown hair can be as versatile —or maybe even more— as any other shade and here is where the variety of purple highlights comes into action and make your hair stand out from others. But take into notice that you should not automatically assume that the hair that you have in mind will be with the end results, or rather, don’t assume that you will know how the brown hair with purple highlights will look; because if you think about it, people think that it’ll look fake and unnatural but I believe that’s the point of purple highlights, to take something that everyone thinks will look bad and showing them that they are a great option for your change of look. Another bright side of having purple highlights is that little kids will look up at you as if you are the greatest and most beautiful thing in the world; some of them even thinking that you are a real fairy! 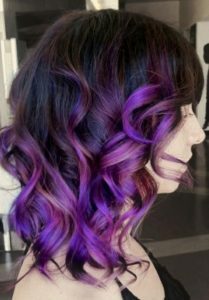 Consider that having purple highlights can make a huge difference with your hair without making a complete change to the same, in short, you will have a makeover without the harsh decisions of dying your whole hair. 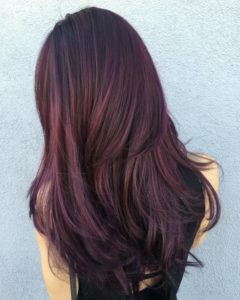 You can add a few electric purple highlights on chocolate brown hair and you can be sure that there will not be a better hair color combination as it will make you use both cool and warm tones. This specific look professionally uses a mixture of the cool tones of the purple and the warmth of the chocolate brown base, creating an impressive contrast of the tones and colors of these two shades. Now, if you want to have a “more natural” look, you can try finding a purple tone that matches your natural brown hair, for example, you can go for some dark highlights that are almost identical to your base color. These subtle highlights will not really stand out when you’re indoors but you will watch them come to life and take the spotlight once you step out into the direct sunlight. 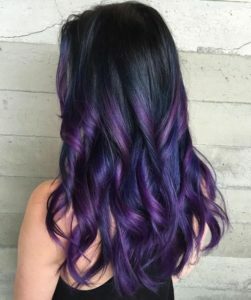 Purple is a perfect color to apply to your black hair as it will make a great contrast between the two colors and it is also a trend that has been very known for the last couple of years and without any doubt will look amazing. 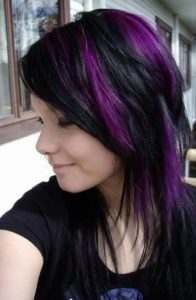 Black hair with purple highlights reflects a young style, perhaps a little gothic, but with great dynamism, strength and adds plenty light to the face. However, you will need to take several aspects into consideration. The first one to consider is that if your black hair is natural —or virgin— or if it has been previously dyed, as the procedure is treated differently depending on which of these two cases is yours. If your hair is virgin the colors will be just as the advertisement, but if your hair has been previously dyed this will make the color look a bit more vibrant and dark. This all has an explanation. And it all depends on how the chemicals react to your hair; it will obviously react differently to a hair that has not been dyed before than to a completely “new” hair. Moreover, another aspect that you should take into consideration is the time that is going to take, many people have the believe that discoloration and coloration of hair all happen in the same salon date, when it’s not like that, professional hair stylists recommend that the coloring is done within 5 or 6 days after the discoloration of your dark hair tone. And this is recommended because in that amount of time, maybe even up it to a whole week, your hair will have recovered from the damage that discoloration produces and will be valuable to apply the color of your purple highlights over healthier hair. Even when it is a rare and hard color to find in the world, it is definitely fun for stylists to work with, trust me, they will love to work with your hair. And this gives you even more options to think for your look. 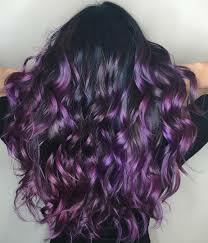 You can go all mysterious and vampy if you choose a dark tone of purple highlights as shown in the picture. If you decide to go for this look we recommend you mix it with some dark lipstick and some age looking clothe and you will look just like a vamp, although you obviously do not have to go for these recommendations as you can contrast it with natural make up and light colored clothes, either way you will look amazing. 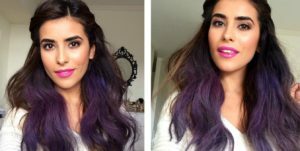 On the other hand, you can opt for a lighter shade of purple which will perfectly give you a great contrast between your natural dark hair and the lightness of the purple. This will give you a more ethereal look, as if you are something out of this world, this color of hair is recommended to be worn with neutral colors —like white or black— so they can stand out! 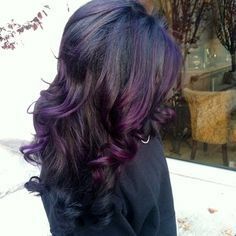 Or you can go completely out of the ordinary and try an ombré look with different purple shades for your purple highlights. 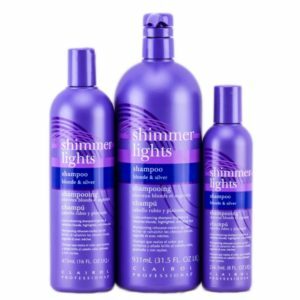 This will give you an even greater contrast as you can go from the darkest shade to the lightest shade all on your own hair. It actually looks amazingly when done correctly. Absolutely! 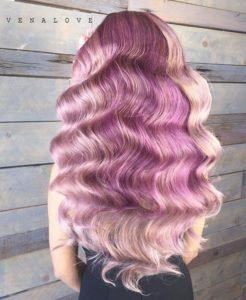 Even if blonde hair is naturally gorgeous, adding purple highlights will make it pop and stand out even more from the crowd, plus you will have a change of look without changing your hair tone completely. 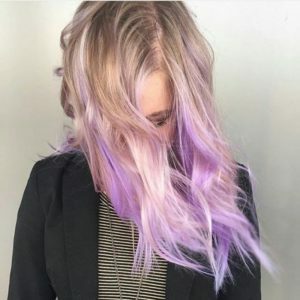 So if you want to turn your blonde mane into something different with purple highlights this is what you need to know about the process and how to give life to your multi-colored hair. 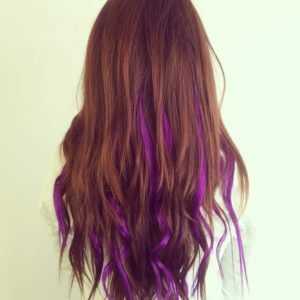 Dying your blonde hair with purple highlights will give you something to stand out from! And, I believe, the greatest part is that if you have light enough blonde hair you won’t have to go through the process of discoloring your hair as you can apply the dye directly on top of your natural hair. First, you should take into consideration that the process can be complicated so we highly recommend for you to leave this process in the hands of a professional that will take care of your hair both to keep it strong and healthy and to give you the best results that you can have after the process and have it in mind specially with procedures such as highlights, ombré or balayage because they need a previous knowledge and skill to apply these techniques. 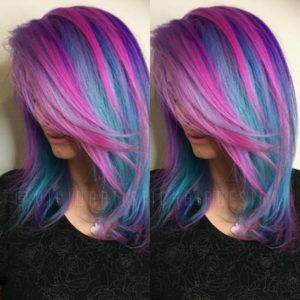 Any hair salon should have at least one person that can apply this to your hair, whether you want the traditional foil purple highlights or a simpler and less intense technique like balayage highlights. 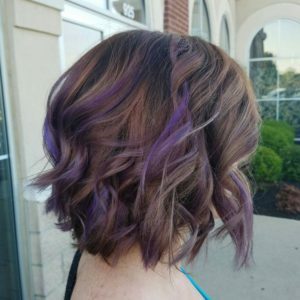 Do you want a bigger color change than purple highlights? Why should we stay with only purple highlights? 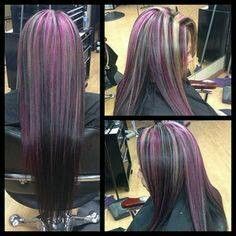 You can mix your purple highlights with any other color. 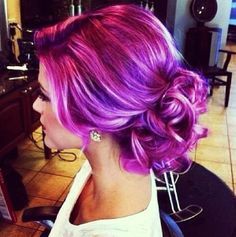 For examples, let’s say you can’t choose between applying purple or pink highlights, how do you make the decision? You mix both colors into a colorful and fun look, mixing this two shades can create a completely new look that you never thought you could have on yourself! But don’t think that pink and purple highlights are the only possible mixture of colors, at all! 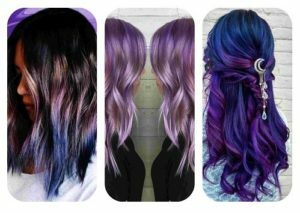 You can create your own combinations, but here we’ll leave some ideas of with what colors you should mix your purple highlights. 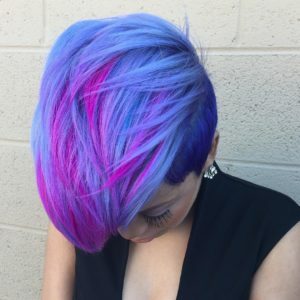 Blue and purple highlights can be fun cool toned purple highlights to add to your style and looks. The will look stunning specially on people with cool tones on their skin, a trick to knowing if your skin tends more to cool or warm tones is checking the veins on the inside of your wrist; If they are blue you tend to cool tones, and if they’re green you tend more to warm colors. Green and purple highlights, I know, I know, it can sound like a complete mess but trust me when I say this. It looks bomb once you apply it to your hair. Now that you have your hair with your beautiful purple highlights, now is the time to take care of it so it does not get all dry and numb because of the chemicals used during the application process. There are a variety of products that you can go too take care of your hair and allow it to look healthy, beautiful and alive at all times. These steps will allow you to continue having your hair full of life with your purple highlights. You can also let us know any further questions about this article and its content in the comment box down below, we will be happy to reply shortly.